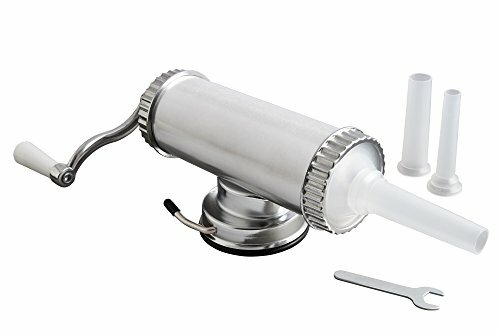 When it comes to stuffing sausage, you need something to make the job a whole lot easier – a sausage stuffer! What is a sausage stuffer? Well, long story short, it’s a kitchen appliance that you can use to push the ground meat into sausage casings. Some of the machines come with different attachments that you can use based on the size of sausage you’re wanting to make. Why do you need a sausage stuffer? Sure, you could always run down to your local grocery store and buy some sausage, but that’s just not the same. Have you ever looked at the ingredients in the sausage at the grocery store? Some companies actually use chemical-based preservatives that can make you sick. When you make your own sausage, you won’t have any of those harmful preservatives in it – in fact, you can customize it with vegetables, different types of meat, spices, and make it however you want. One of the biggest advantages of having a sausage stuffer is, of course, making your own sausage. However, there are more advantages to stuffing your own sausage at home. Fresh – When you make your own sausage at home, you won’t have to wonder if the sausage is fresh or not. When you buy it from the store, who knows how long it’s been sitting there. Know Your Ingredients – As I said in the beginning when you buy the sausage from the grocery store, you never know what’s in it. Flavor – Whether you prefer sweet, spicy or savory sausages since you’re making it yourself, you will be in control of the flavor. Ingredients – Have you ever had a veggie sausage? When it comes to your sausage mixture, you can make it however you want. Starting out, we have the Hakka Sausage stuffer, which is highly recommended for those that are looking for sturdiness and durability. I personally like how the machine tilts back, making it easy to fill. There’s also a metal piston on this machine with an air release valve. The air release valve is there so that air can escape up and out of the top of the machine, instead of into the sausage casing like some of the other machines on the market – just make sure you clean that out when you’re done stuffing. The Hakka sausage stuffer is stainless steel all around. This means everything on this machine is stainless steel, even the stuffing tubes. This machine is created to be able to handle a large amount of meat all at one time, which is definitely a good thing. I also feel the need to mention the four nozzles on this machine. You have 0.62, 0.86, 1.25 and 1.5 inch nozzles and yes, those are also stainless steel. It offers two fill rate systems – you have easy to use and quick. The Hakka sausage stuffer also includes 4 stainless steel stuffing tubes and 4 plastic feet. In my opinion, the Hakka sausage stuffer is one of the best sausage stuffers you’re going to find on the market. We cannot seem to get over the fact that everything on this machine is stainless steel, which is a major bonus. When you want to start making your own sausage, a meat grinder will come in handy. 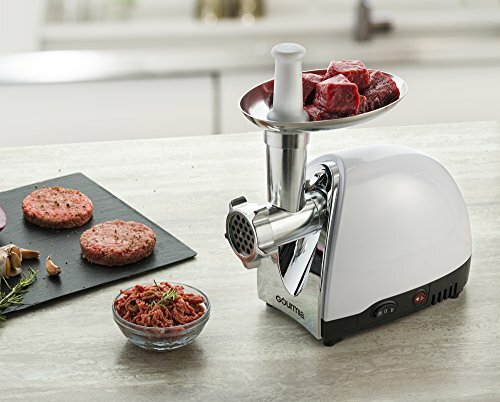 With the right grinder on hand, you won’t have a problem creating ground meat for your sausage. 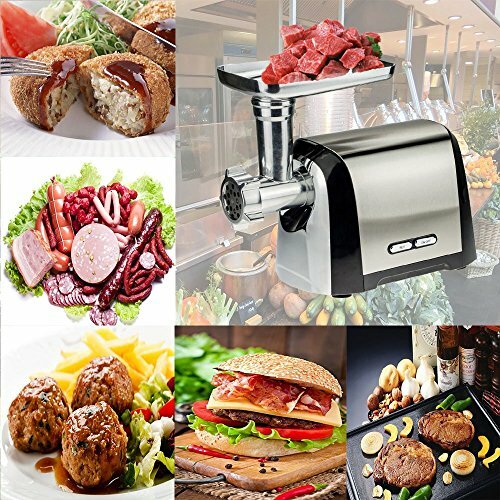 After a large amount of research, I came across the Ultra Appliance meat grinder, which seems to be one of the top ones and is great for every cooking occasion. Best of all it comes with its own sausage stuffing kit so you can mince the meat of your choice and then make the sausages. This is a much cheaper solution than buying a dedicated meat grinder and dedicated Sausage Stuffer. The overload protection and stable suction is really nice. There’s a reversal setting, which makes it easy to unclog. When it is all said and done, cleaning this machine is super easy as the machine is easy to put together and everything that comes in contact with the meat is easy to dismantle and clean. If you’re the type that doesn’t mind using your hands, then you’ll like the vertical sausage stuffer from LEM’s. This is a manual unit that is made from stainless steel. However, unlike with the Hakka sausage stuffer, the tubes in this one aren’t stainless steel, they are plastic. The cylinder on this machine has a 5-pound capacity, which is great if you don’t plan on making large batches of sausage. However, if you plan on making a large batch of sausage you will need to do it in different turns, or get a sausage stuffer that has a larger capacity. Three tube sizes – ½, ¾ and 1-inch. All in all, this is a handy little machine and great for those that plan on making a small batch of sausage. The tubes may not be stainless steel, but that’s not all that big of a deal. You also get a book of recipes, casings, and seasoning so you are pretty much ready to go as soon as you receive the LEM Sausage maker. The Fantes Sausage maker is another great sausage maker that deserves a spot on this list of the best sausage stuffers for home use. With the Fantes sausage maker, you can easily create your own fresh sausage recipe in no time at all. This sausage maker can hold up to 2.2 pounds of fillings in one setting, which is decent for those that plan on making small batches of sausage from home. The suction base may become unstuck from the counter after using it for a couple of minutes. This is a nice little machine that will help you stuff your sausage in no time at all. It’s so easy to use that even people who have never made their own sausage before were able to figure it out and start making home-made sausage in no time at all. 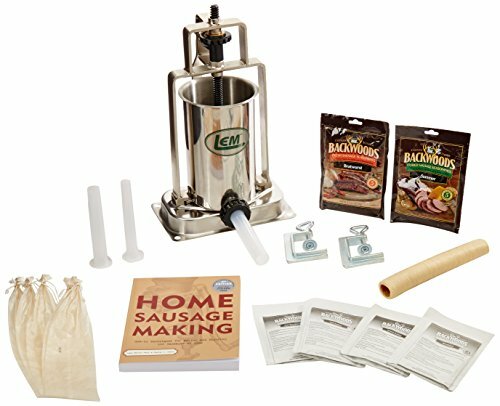 Its inexpensive price makes it a good choice for someone who wants to try out sausage making at home without having to spend too much to get started. Another good meat grinder you can find on the market comes to us from Gourmia. If you’re looking for a combination of quality and functionality, then this is definitely something you’re going to want to hear about. It has a 500W motor and is a fairly small appliance, but don’t let that fool you. It has steel gears, along with a grinder head that can be removed. It also contains stainless steel cutting blades that come in three different sizes – course, fine, and medium. With features like this, you can rest with the satisfaction of knowing you’re going to be able to make all the sausage you want. Putting it together is fat and the grinding process is also quick. Some reported that it jams up while grinding. However, an easy fix to this would be to make sure the meat is properly chilled beforehand. The Gourmia meat grinder is well worth the price and it is great for both beginners and experienced grinders. For those of you that are looking for a heavy duty appliance, look no further than the New Vivo sausage stuffer. On this sausage stuffer, the cylinder and spout are stainless steel, but the gears and pistons are made of durable metal, which isn’t a bad thing. The size of the cylinder is quite large – it is big enough to fit 7 pounds of meat in it. 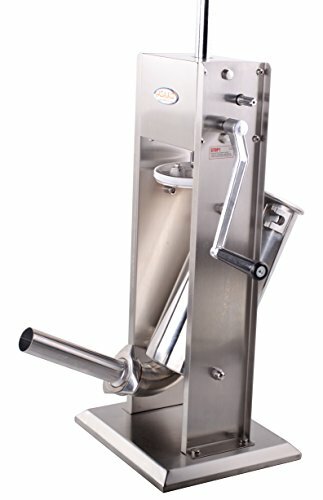 So, if you’re the type of person that plans on working with a large amount of meat, the Vivo sausage stuffer is your machine. 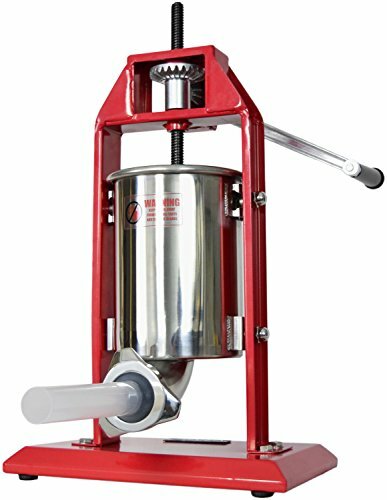 Point blank, for those who are looking for a sausage stuffer that can hold a lot of meat, then New Vivo sausage stuffer is a must have. When it comes to choosing a sausage stuffer, regardless of who you are, it is always a good idea to sit down and take a look at the options you have in front of you. Each machine we included on this list has been thoroughly researched in order to make sure we only include the best on the market. 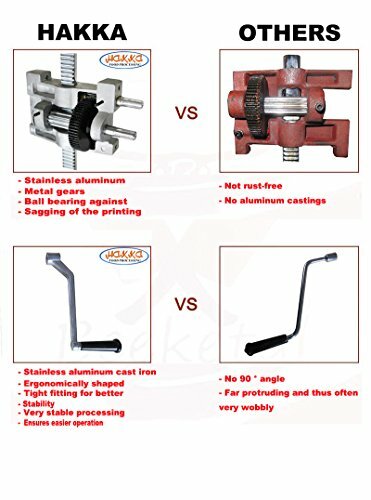 Whichever machine you go for, whether it’s the large Vivo or the stainless steel Hakka sausage stuffer, you can rest with the satisfaction of knowing you made the right choice.